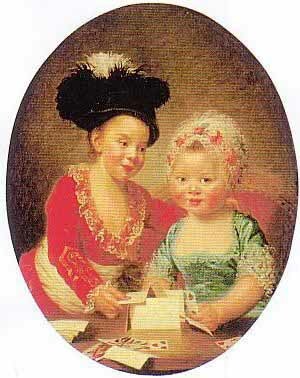 If Vigee Le Brun's lists record her earliest sitters in correct chronological sequence, her first titled sitter was a "Baronne d'Esthal," whose portrait immediately preceded that of her two children ("Ses deux enfans"). The Cailleux painting can be identified with this entry on the weight of an inscription found at the back of the original canvas before its relining: L. M. d'esthal. The painting is unsigned, but its ascription to Mlle Vigee is unimpeachable; its already skillful technique is that of the signed and dated portrait of an unknown child formerly in the collection of Irma N. Straus (sold, New York, Parke-Bernet, October 22, 1970, lot 16, illus. in catalogue). Although amusingly dressed as adults in colorful costumes of velvet, silks, lace and plumes, the little brother and sister are barely out of infancy. The artist's depictions of children frequently show them engaged in some activity, e.g., playing with animals, reading, knitting (fig. 2), picking flowers. In the d'Esthal portrait, the two are building a house of playing cards. The theme was recurrent in eighteenth-century French painting and was utilized among others by Chardin and Drouais, whose works Mlle Vigee had carefully studied. In the hands of a Chardin, the subject matter retained all the traditional resonances of the vanitas, expressing as it did with some solemnity the futility of human endeavors. Nothing of the sort is implied here, and the activity is exploited merely for its picturesqueness. PROVENANCE: Marquise de Nesle; acquired in 1912 by Paul Cailleux. MAJOR EXHIBITIONS: Paris, Galerie Charpentier, La jeunesse, 1929, no. 37; London, Sir Philip Sassoon, Three French Reigns, 1933, no. 481, illus. in catalogue; Copenhagen, Charlottenburg, L'Art francais au XVIIIE siecle, 1935, no. 254; Paris, Galerie Charpentier, L'Enfance, 1949, no. 208; Paris, Galerie Caflleux, Ames et visages de France, 1952, no. 66; Paris, Galerie Cailleux, Cailleux 1912-1962, 1962; Paris, Grand Palais, Salon des Ind6pendants, Retrospective des feinmes peititres, 1975; Paris, Galerie Cailleux, Eloge tie l'ovale, November 18 - December 4, 1975, no. 46. REFERENCES: Souvenirs, 1, 318; illus. in L'Oeil, No. 244, November 1975, p. 68.